Adore this combo—that scarf is so cute! 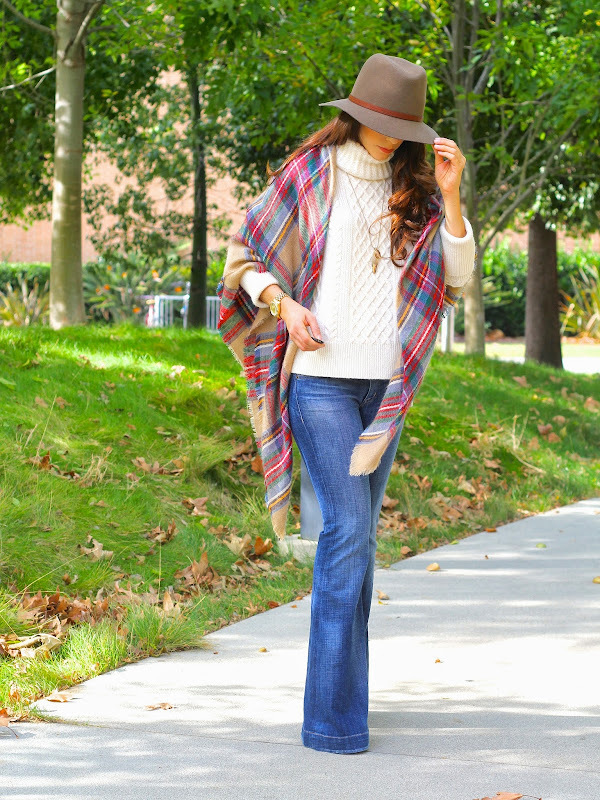 i love this whole outfit..the hat, the scarf, but the flared jeans completes this whole look!! love love! love having sisters for that reason! I love this look!! I have been swooning over that rag & bone hat for a few weeks now! I especially like the way you draped your blanket scarf. Thank you so much for the kind words Elena! Hope you are doing well! The hat is beautiful! It's definitely on the pricier side, but I love the quality and fit. But, I could never justify the price tag lol, so it's a good thing that I could borrow it from my sister when I need it! I really have to get one of those big scarves. Every time I see someone wearing one, I want one. This look is so perfect. I love the knit sweater with the blanket scarf. You totally rock the flair jeans. Just came across your blog!! and I'm obsessed!! Your style is perfection!! LOVE!! Gorgeous, chic look!! I have a similar blanket scarf and now I just need a gorgeous cream sweater like this to wear it with! Great Plaid scarf! The hat is the perfect finishing touch. I've been looking for bell bottom jeans like these Hudson! Cute! My imagination went straight to the wild west when I saw this outfit, I feel like I'm watching an old western black and white movie in colour (and in the preset day) and you're the western bell two cowboys are fighting over or the beautiful ranch owner slash not-so damsel in distress needing rescuing from two-bit thugs who are taking over her cattle or some bizarre storyline thing. Love how you put it all together!!!! Wishing you the best of the holidays!!! Oh, I just love that scarf of yours! It looks so incredibly cozy. This is so chic and perfect darling! Cool hat and bell bottom jeans! This might be one of my favorite looks of yours, so chic!